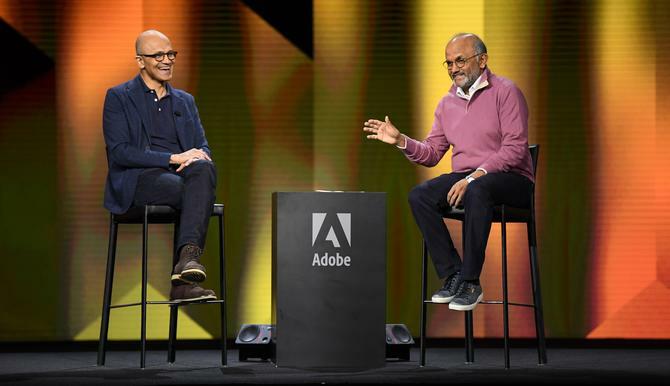 That’s the view of Microsoft CEO, Satya Nadella, who spoke at this week’s Adobe Summit on the way 44-year old Microsoft has worked to transform to retain its position in the top echelons of the tech company table, and the criticality of culture and learning in his approach. To enact business transformation, you have to get two things right, Nadella said. The first is exhibiting a first-class world view of where your industry is going, where technology is going and what you can do with new tech trends. In striving to keep Microsoft’s market dominance, Nadella said he turned to the customer purpose behind its mission and culture as a north star. “In tech companies we have to get a lot right – we need to understand where the world is going, bet right long before convention wisdom exists on tech trends, and produce products customers love all. All that is a given. But what is the real source of inspiration for getting those right and necessary conditions to get your strategy right?” he asked. When he joined Microsoft in the early 1990s, Nadella said the mission was to place a PC in every home and desk. By the end of 1990s, that mission had more or less been achieved in the developed world. In looking for its next big purpose, Microsoft settled on empowering every person in the organisation on the planet to achieve more. This gives the company a deep sense of meaning, Nadella said. Key cultural aspects include embracing continuous learning and shifting from “being know-it alls to learn-it alls”, Nadella said. He referenced Carol S Dweck’s book, Mindset: The Psychology of Success as a source of insight. It’s also about empathy, something Nadella saw as core to innovation. “The more we can invoke our ability to meet the unmet unarticulated needs, that’s the source of innovation. And that source comes from having a deep sense of empathy,” he said. And Nadella believed CMOs and CIOs are perfectly positioned to drive this capacity to innovate. In doing so, he described the need to fail fast and have ‘no regrets’. “This is about how to build long-term systems – such as the Open Data Initiative [ODI], Experience Cloud, data lake - and create that experimentation harness on top of these systems. Then the key is to build the social side that embraces rapidly continuously experiment,” he explained. “A measure we try to create internally is how quickly people are rewarded for disproving their hypothesis. You have to give credit to people who proven themselves wrong. Nadella also discussed key tech trends and how they’re applying to all organisations today. Top of the list is computing being more distributed and ubiquitous. “What’s interesting is the digital transformation it’s ensues,” he said. “Pick your sector of the economy it’s all being transformed by the availability of computing power. Nadella then cited three layers of intelligence-driven tech transformation. The first is computing being distributed to the edge. “Whether it’s autonomous vehicles or warehouses, the most interesting things are happening at the edge,” he claimed. “The second thing is when you have a lot of compute power, you do artificial intelligence, and reason over large amounts of data to create these next-generation experiences. The last is the experience layer. “It’s no longer about natural interface into one device,” Nadella said, noting Microsoft’s Hololens as one of these “instinctual user interfaces” coming onto the grid. “If you take that and apply to retail, you see online and offline being blended into one personalised shopping experience. With manufacturing, where there is a lot of tech intensity. We’re putting so much compute in the factory floor, so with all the sensors out there, you can run things at the edge and ensure your production lines are that much more efficient and quality is there. In financial services, people are creating new products.